I am informed from Dr. Gunji Hosono that a warship sunk by a destroyer of the Japanese navy during the Solomon Islands Battle in August 1943 was under your command. This is a big surprise to me as I happened to be the Commander of the destroyer which sunk your ship. When I read the Time magazine August 18, 1952 which mentioned the battle in question, my memory being refreshed, I can vividly recall what happened at that time. I regret very much that I missed the opportunity of meeting you during your last visit to Japan. As I was living in the Fukushima Prefecture, northern part of Japan, I could not make contact with you during your brief stay in Tokyo although Dr. Hosono succeeded in locating me after great difficulty. I am looking forward to seeing you in your next visit to Japan. Now allow me to take this opportunity to tell about myself. I had been the destroyer commander since October 1940. 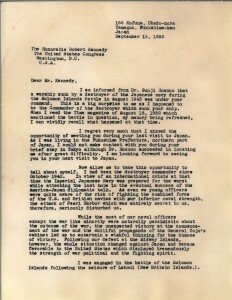 In view of an international crisis at that time the Imperial Japanese Navy was prepared for the worst while attaching the last hope in the eventual success of the America-Japan diplomatic talk. As even we young officers were quite aware of the risk of fighting the combined force of the U.S. and British navies with our inferior naval strength, the attack of Pearl Harbor which was entirely secret to us, therefore, seriously disturbed us. While the most of our naval officers except the war like minority were naturally pessimistic about the outcome of the war, the unexpected victory at the commencement of the war and the skillful propaganda of the General Tojo’s cabinet led us to entertain a wishful thinking for the chance of victory. Following our defeat at the Midway Islands, however, the whole situation changed against Japan and became favorable to the United States which displayed tremendously the strength of war political and the fighting spirit. I was engaged in the battle of the Solomon Islands following the seizure of Laboul (New Britain Islands). I was very much concerned with the situation which then was further aggravated by the successive defeat in the battle of Guadalcanar. From November 1942 to May 1943 I was assigned to the duty in the Track Islands Water. It was early June 1943 I was transferred to Laboul again as the commander of the destroyer Amagiri. From that time the counter-attack of the American force became increasingly offensive. As Americans controlled the air, we were in no more position to attack in daytime and we had to operate in night, attempting in vain to prevent, by destroyer force, the transportation of the American men and munitions. We met the disastrous defeat in Kure in early June when our flag ship was instantly sunk at the first encounter by your fleet, equipped with radar (which we were not aware) and this was followed by the subsequent defeat with the result that we were forced to retreat to Laboul after the series of the unsuccessful battle. In one of the night battle in early August 1943, I sighted a bold enemy boat of small size was heading directly toward my destroyer of a larger type. Having no time to exchange gunfires as ships came so close to each other, my destroyer had to directly hit the enemy boat, slicing in two. To my great surprise this boat happened to be the P.T. boat which was under your command. I take this opportunity to pay my profound respect to your daring and courageous action in this battle and also to congratulate you upon your miraculous escape under such circumstances. I come to know from the Time magazine that you are going to run for the next election of Senators. 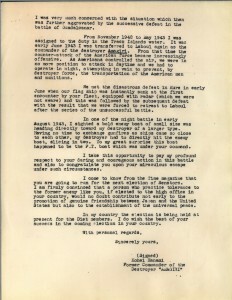 I am firmly convinced that a person who practice tolerance to the former enemy like you, if elected to the high office in your country, would no doubt contribute not early to the promotion of genuine friendship between Japan and the united States but also to the establishment of the universal peace. In my country the election is being held at present for the Diet members. I do wish the best of your success in the coming election in your country.